The episode, disclosed by Coincheck executives at a hastily arranged press conference on Friday night, comes at an awkward time for Japanese regulators, who began rolling out a new licensing system for cryptocurrency venues just a few months ago. It has heightened calls for stricter oversight and may influence a closely watched debate in neighboring South Korea over whether to ban digital-asset exchanges outright. The Coincheck incident adds to a long list of thefts at cryptocurrency exchanges and wallets, stretching back to the robbery of Tokyo-based Mt. Gox in 2014. A lack of confidence in such platforms has prompted many institutional investors to spurn cryptocurrencies, although some are now dipping into the market after CME Group Inc. and Cboe Global Markets Inc. introduced regulated Bitcoin futures in the U.S. last month. The exchange hadn’t implemented the security measures due to “the difficulty of the technology and a lack of staff able to carry out the task,” Wada, who also serves as Coincheck’s chief technology officer, told a roomful of unusually combative reporters during a 90-minute press conference at the Tokyo Stock Exchange headquarters that stretched into the early hours of Saturday morning. Coincheck was four months past its deadline for receiving such a license, but was allowed to continue operating — and advertising on television — while awaiting a final decision from the FSA. The exchange’s fate remains unclear. While Coincheck executives have said they plan to eventually restart trading, they hadn’t outlined a timeline by Sunday evening. They did, however, pledge to compensate all 260,000 users impacted by the theft, at a rate of 88.549 yen (82 U.S. cents) for each NEM coin. 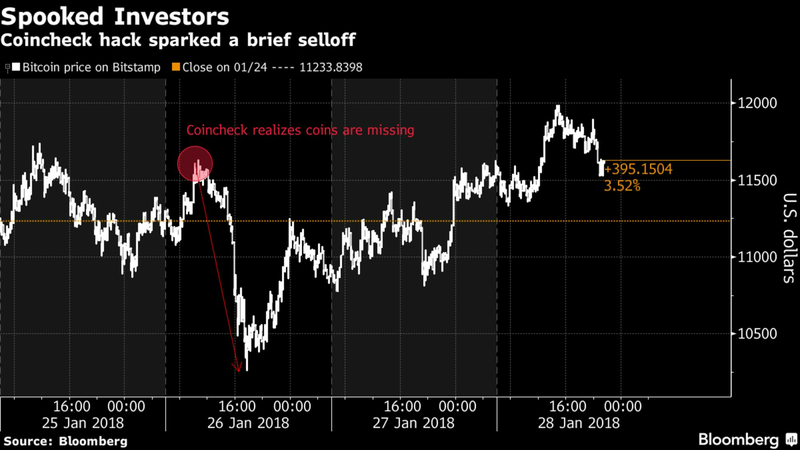 Coincheck also said it was cooperating with other exchanges in the hope of tracing the missing tokens. The FSA has said it’s looking into the incident.